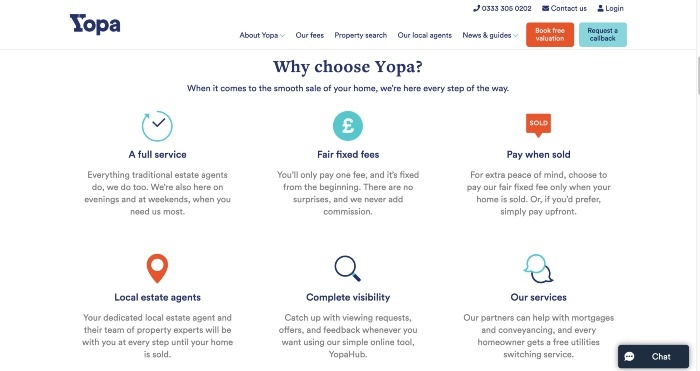 Yopa Review - Is This The Best Online Estate Agent For You? Yopa Review – Yopa have attracted significant investment from a range of entrepreneurs and funds, including the parent company of the Daily Mail newspaper. You may have seen them advertising on TV, but, let’s take a look at how they perform in our Yopa Review. Yopa may have some really innovative, engaging TV adverts, and their website may be really well put together, but they are also a very serious online estate agent capable of selling homes. Is Yopa The Best Agent For You? How Much Does Yopa Cost? Yopa have a fixed-fee price of just £889 which is payable up-front, however, there is an interest-free option to pay the fee in 10 months time you prefer. This is the standard price that will apply to most people, but do be aware that some London postcodes have a higher fee. As far as packages go, the Yopa package does include everything you would expect, plus a couple of nice additions such as the ability to communicate directly with your prospective buyers. As of early 2018, Yopa began offering a ‘No Sale, No fee’ option priced at £1,999 for most of the UK, or more for some London postcodes. While it’s fairly uncommon, Yopa do occasionally issue discount codes. When there is one available, you’ll find it on our Yopa voucher code page. Prices were correct at the time of writing our Yopa review, but please check the Yopa website for any changes to add-on options. One of the main disadvantages of online estate agents is you usually have to perform all the viewings yourself which can be tricky if you lead a busy lifestyle. Yopa solve this by offering a viewings package which passes all the management and conducting of viewings over to them so you don’t need to worry about it. This helps bridge the gap towards a more traditional estate agency service whilst still keeping the costs considerably lower. The Energy Performance Certificate is priced a little high, but you may not need this if your property has had one issued in the last 10 years. You can check if your property has a valid EPC at the EPC Register. Why Use Yopa Estate Agents? Unlike some online estate agents, you cannot instruct Yopa to sell your property until you have had them carry out a free valuation of your property for you. Therefore, the first step is always to book your free valuation through the Yopa website. The valuation is performed by a local Yopa agent and they’ll also use the opportunity to explain Yopa to you in more detail. Once you instruct Yopa you’ll need to either pay the upfront fee in full or sign an agreement to pay the fee in 10 months time (regardless of whether your property sells or not). Your Yopa agent will then create your advert using professional photos and a detailed floorplan. You’ll get to approve the advert before it goes live on sites like Rightmove, Zoopla, and PrimeLocation. Unless you have chosen the viewings package add-on, you’ll then manage all your viewings via the YopaHub online platform. You’ll get an alert once an offer has been received and you can communicate directly with your buyer or allow your agent to handle the negotiation. Once the sale is agreed, the Yopa team will keep in touch and support you all the way to the successful completion of your sale! From start to finish, offered a genuinely first rate service with local experience and customer focus to achieve the best results and talk frankly about the process. Can’t believe the price this was achievable for! So, Is Yopa Any Good? Our Yopa review has found that Yopa offer an all round good service with a genuine commitment to providing a good customer experience. This is backed up by a 5-star rating on TrustPilot from over 1,700 reviews. The fixed fee of £889 may not be the very cheapest out there but you do get a lot for your money including a ‘For Sale’ board and access to the YopaHub online platform. It’s also great to know that there is the added option to have a local agent conduct your viewings for you should you lead a busy lifestyle. Yopa claim that the average person who sold using them found a buyer in under 29 days. This is very fast and also gives a good indication as to why they have so many positive reviews. It took them a while but Yopa do now offer a ‘No Sale, No Fee’ option although the cost in some London postcodes for this option is a fairly pricey £2,695+. This is compared to the £1,999 they charge most areas for ‘No Sale, No Fee’. If you’re in London then the standard up-front fee is more for some London postcodes. Whilst this seems a little unfair, it isn’t uncommon for online agents to charge more for certain parts of London. If you’re not in London then don’t worry, the fixed-fee price of £899 is all you’ll pay for the standard service. Keep in mind too that even if you know how much you want to sell for, you’ll still have to go through the process of having a Yopa agent come down to do their own valuation. This shouldn’t be a major issue but it will lengthen the process slightly. The name Yopa is a shortened version of ‘Your Property Agent’ and the company began life in 2014 as a purely online estate agent. Early customers paid a reduced amount simply for Yopa to list them on property sites such as Rightmove and Zoopla (only estate agents can create new listings on these portals). However, it was quickly realised that people appreciate the human interaction and added expertise a traditional estate agent provides. That led to Yopa changing the way they do business and rolling out nationally in January 2016 as a full-service online estate agent. Despite being a relatively new agent, Yopa have quickly attracted some big-name investors (including Savills), thanks partly to two of the owners of Yopa being Andrew and Alistair Barclay, the grandson, and son of Sir David Barclay, who owns the Daily Telegraph. Overall then, our Yopa review has found a very solid online estate agent with plenty to offer anyone who chooses to sell their property with them. In fact, given they are such a new player in the market, it’s impressive just how quickly their reputation has grown alongside their 5-star rating on TrustPilot. The price may not be the cheapest out there but it’s very fair nonetheless and gives you all the expected services and plenty of local knowledge and expertise from your local agent. There is now a ‘No Sale, No Fee’ pricing option, but if you are serious about selling, the up-front pricing option is very attractive as Yopa do have a great track record at finding buyers quickly. What’s really nice is that if you don’t want to spend the time conducting your own viewings, you can add on the package to have Yopa manage and conduct viewings for you. This saves you a great deal of time and stress. Overall then, it’s a very strong agent that comes highly recommended.